Learn the 3A trick known as Devil’s Snare. 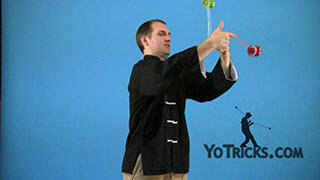 To do this trick, you are going to start off by doing a Gunslinger to the inside of both hands. 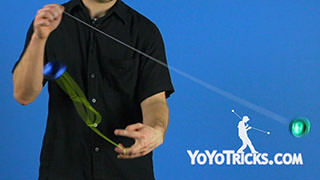 You want to make sure you know how to do that trick, so you can go check out our video on Gunslinger Whips. 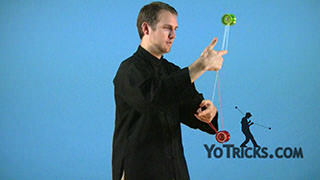 The next part of the trick is easiest to learn when it is just one hand at a time. So, take your dominant hand. Do a gunslinger whip to the inside. 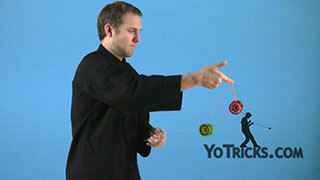 Stick your non dominant wrist out and you are going the throw the yoyo on the outside and let the loop off your finger so that it rolls over your opposite hand wrist. Stick your index finger out and you are going to mount it over your index finger. 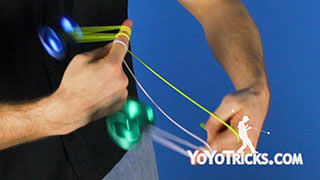 This essentially puts you in a Trapeze and his Brother mount, but your opposite hand wrist is through the mount instead of the finger. 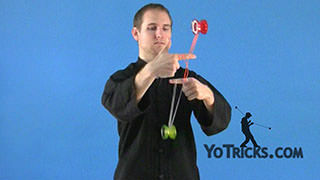 From there, we are going to do essentially the same thing with the left hand. 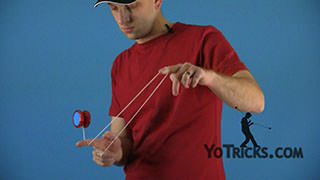 We are going to go from a gunslinger mount, throw the yoyo around the wrist, and then land in a trapeze and his brother. 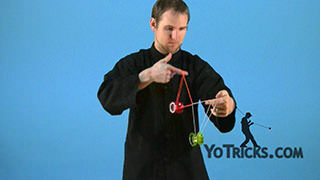 But there is a few tricky parts with it. 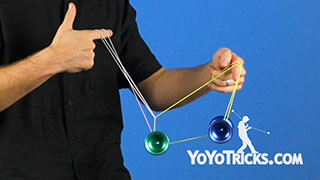 So I will show you how to do that. Get into our gunslinger mounts, throw the right hand over. Land the mount. 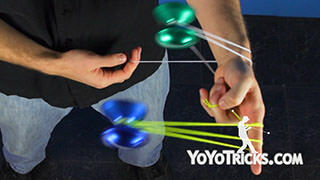 From here, you want to take your right hand and pinch the string here. 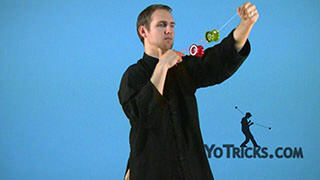 At the same time you are going to throw with your index finger of your opposite hand and pull your wrist through the string formation. You end up in this position right here. You can see that there is a lot of slack coming off your dominant yoyo and this string is taut on your non dominant yoyo. 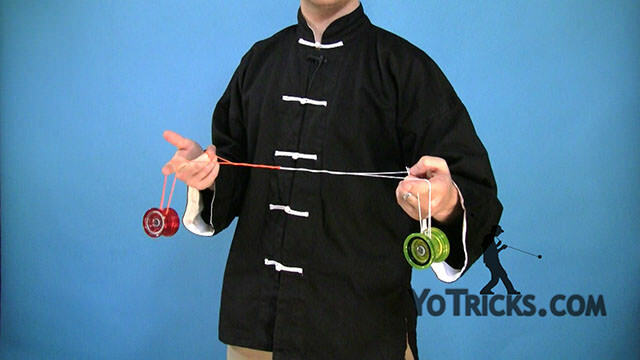 The slack over here on your dominant yoyo does not really matter, you just want to keep it out of the way. 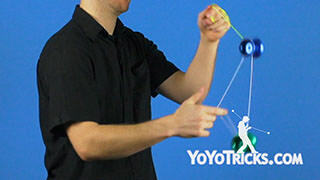 You are going to take your index finger, put it over that taut string, and mount your opposite yoyo onto it. So you end up in a trapeze and his brother mount just like that. 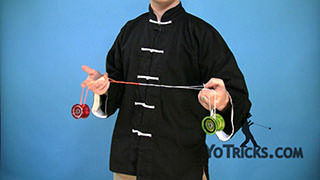 The last past of the trick we are going to do that motion again. 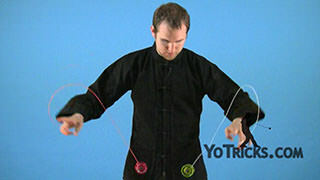 We are going to take, this time our dominant hand again, throw around and as we do that, we are going to pull our wrist through the string formation. What you will find is that will actually undo kind of all of the kinks. It will end us back up in that trapeze and his brother mount that we were in after our first throw. 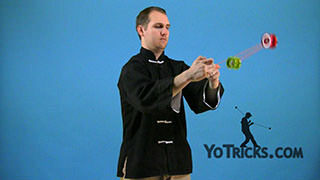 From there, you will find you are actually set up to repeat the trick if you want. Left hand, right hand, left hand, right hand. I will show you exactly how that looks. You do dominant hand, land. Non dominant hand. 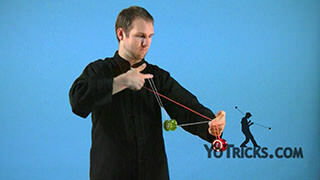 Then we do dominant hand again, pull the string through. Once you are here, again, you can repeat, or the easiest way to get out is to dismount. 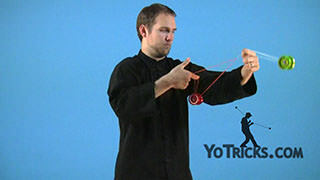 As the yoyo is swinging, you can do, I like to do a gunslinger whip. 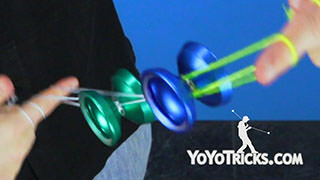 From there you can drop the yoyos. 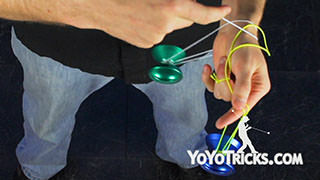 Bind them, bring them back to your hand. 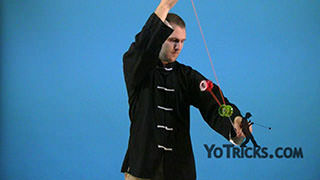 You are actually set up, this time, the gunslinger whip is on the outside so you can do a gunslinger bind if you want from there. 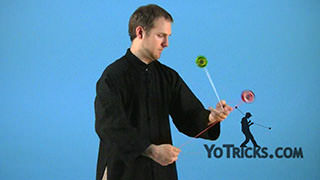 Another great thing is if you know the trick Incendio, when you end you are actually set up right in place to be able to do Incendio. Which means you can do that trick, get into an 1.5 kink mount, and combine Devil’s Snare with other tricks that you know to make a nice good combo. 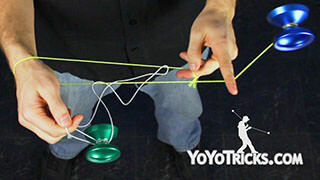 But once you have got it down, that is how you do Devil’s Snare.